Cost: £1 for a pack of 4. 30 ml/1 fl.oz bubble mixture. Comments: Where does it all come from? I don't remember ever buying any bubble mixture but we have a dozen bottles of the stuff filling a drawer. We've got big ones, small ones, ones with wands, ones without, Disney themed ones, ones so rubbish that creating any bubbles at all is a triumph, leaky ones, ones with a puzzle in the lid and even one which makes bouncy bubbles. I haven't dared try the last lot - I suspect the mixture must contain at least a small amount of evil. Bouncy bubbles? What next? Glow-in-the-dark bubbles? Oh... Call off the chemistry set - it exists already. 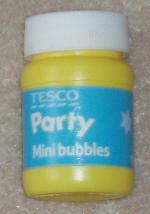 Anyway, I think the bubble mixture mainly turns up in party bags. I've been trying to get the kids to use it up but every time the stock starts going down, half a dozen of their friends thoughtlessly have birthdays. I'm going to need grandchildren to get through this lot. The bottles are small, meaning a child tipping the entire contents over their shoes isn't too much of a disaster. The wand is easy to hold because it's attached to the inside of the lid. This reduces the chance of getting sticky fingers if the kids insist you take over blowing duties. The lid goes on tightly and it's safe to keep the bottle in a pocket. Having the wand attached to the lid does make it next to impossible to use the mixture in the bottom of the bottle but there's enough within easy reach to keep blowing bubbles long after most children have got bored. The top of the bottle is wide, allowing refills from lesser bubble mixture containers. Of course, it's still only bubble mixture. Even fairly old children will drip it and spill it everywhere. Smaller children will hold the wand a foot from their mouth or try to kiss it. (Neither of these techniques produces many bubbles.) Take the bottle outside and blow the bubbles yourself, however, and you can easily keep a dozen children chasing around popping them for twenty minutes. Conclusion: Great for padding out party bags, entertaining small children as you hang around waiting for their siblings to come out of school and for enlivening parties anywhere with a moppable floor. The wand is easy to hold without getting sticky fingers. Not much mixture in each bottle. It's bubble mixture - someone or something is bound to get sticky, whatever you do. Doesn't make your children glow in the dark.